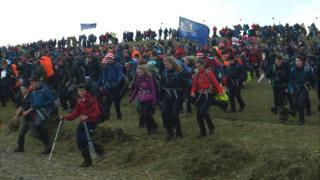 Thousands of teenagers are trekking across Dartmoor in the famous Ten Tors challenge. Competitors aged 14 to 19 are hiking distances of up to 55 miles (89 km) visiting 10 nominated tors over two days. The 56th event started at 07:00 BST, with 2,400 teenagers - many from school and youth groups from across the South West - taking part. The first teams are expected to cross the finish line on Sunday morning. During the challenge teams visit 10 nominated tors, which are hills or rocky peaks. The teenagers left Okehampton Camp, where Dartmoor National Park head ranger Rob Steemson said it was an "enormous challenge". The event is organised by the Army and assisted by the Royal Navy, the Royal Air Force and the Dartmoor Rescue Group. Each team has a GPS tracker, so safety teams can find out where each group of teenagers is. The tracker also has an emergency button if help is needed.